← Alarm Will Sound’s 1969 at Zankel: What Is a Musician’s Responsibilty to Society? I’m going to play Bach. In a New York City subway station (probably the uptown side of the 1/2/3 96th St. station). On Bach’s birthday–Monday, March 21. I’ve never played in a subway before, but I’m looking forward to it. Dale Henderson, the Bach in the Subways cellist, invited me. You, too, if you’re a musician and going to be in New York. (Here’s Dale’s invitation on Facebook. He’s also on Twitter.) What a great way to celebrate Bach’s birthday! A week ago tonight (Monday, March 7), I’d been to that great Tyondai Braxton/Wordless Music Orchestra concert at Tully Scope. I usually walk home from concerts at Lincoln Center–it’s about 26 or 27 blocks, a bit over a mile and a quarter. But I’d stopped at Trader Joe’s and had a bag of groceries, and my personal trainer had really earned his money earlier in the day. I was tired. So I got on the subway, and got off at 96th St.
And, to my surprised delight, there he was. I’d read about him on the Wall Street Journal and CNN sites. 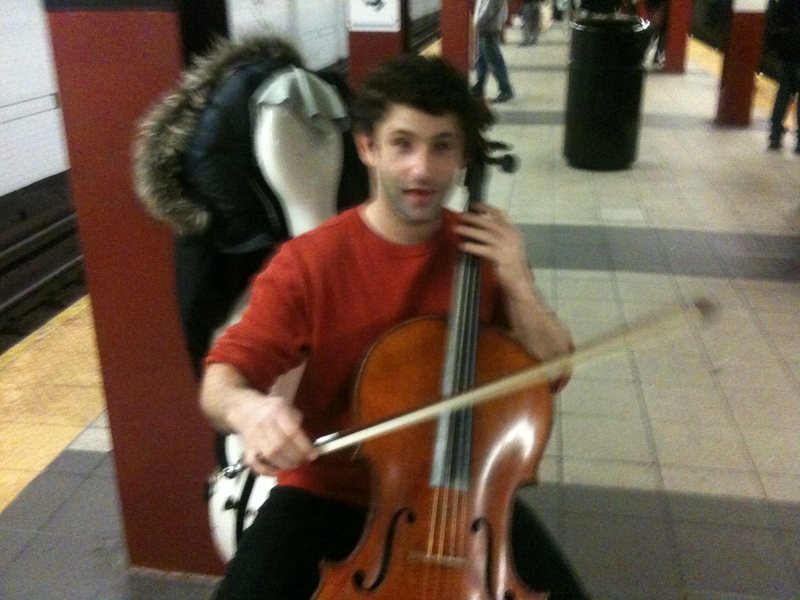 He wants to share classical music with as many people as possible, so he plays Bach Suites in subway stations, accepting no money, handing out postcards about the project. He was playing the Prelude of the C Minor Cello Suite, with love and commitment. I was so excited–I’ve been wanting to meet him and hadn’t gotten around to tracking him down. Such serendipity–if I hadn’t bought groceries, or wasn’t tired from working out, I would have missed him. When he finished the Prelude, I introduced himself. We had a great chat, and he told me how he wants to get as many musicians as possible to celebrate Bach’s birthday by playing in a subway station anytime (midnight to 11:59 PM) on Monday, March 21. So of course I said yes–I’ve been wanting to play in the subway, just for fun, and have just been waiting for the weather to clear up.